Amid Israeli deathly assault on Gaza, tens of thousands of Palestinians has been facing deteriorating humanitarian situation. Much of Gaza's territory has affected by evacuation warnings or declaration "no-go zones" by the Israeli military, caused many Palestinians seeking refuge in safer areas. The U.N. refugee agency (UNHRC) defines the IDPs as "legally remain under the protection of their own government" while being "protect[ed] under both human rights and international humanitarian law." However, they have no places to hide or feel safe as to being unable to leave the Gaza strip. Due to the eightyear long Gaza siege and largely closed borders, the internally displaced Palestinians cannot move to any other place, except Gaza, or seek safety in neighboring countries. This proves that Palestinians, among the world's other internally displaced persons (IDP), becomes the most vulnerable ones. Palestinians Palestinian IDP figures analysis of Internal Displacement Monitoring Centre (IDMC) show that 339,600 people were displaced in the Gaza strip since Israeli military operation "Protective Edge" launched on 8 July. According to OCHA reports, as of 6 August, 187,000 people are still displaced in 90 U.N. emergency shelters and "around 29,000 found shelter in 23 government schools or other institutions; approximately 123,600 IDPs registered with the Ministry of Social Affairs (MoSA), as well as an estimated 93,000 unregistered IDPs were staying with relatives or friends". After the humanitarian truce came into effect on the 30th day of Israeli military operation, the displaced civilians were allowed to return their homes, and they have been shocked by the scenes of Israeli-led destruction. "800 houses have been targeted and destroyed by Israeli warplanes, and thousands of houses have completely or partially destroyed" during Israeli attacks deliberately targeting Palestinian civilians and property protected under the international law, according to Palestinian Centre for Human rights report released on 7 August. 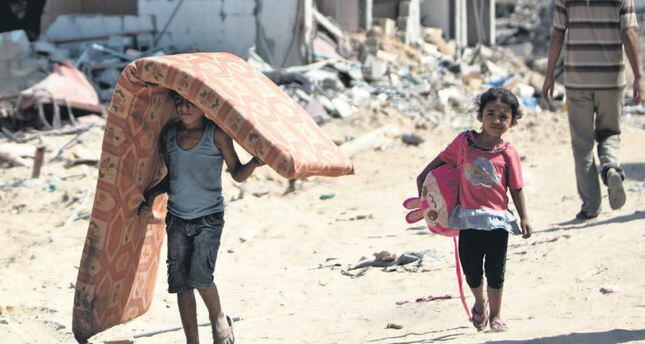 Israeli mass destruction in Gaza left many Palestinians homeless that they have no home left to return. OCHA reports that 65,000 displaced people have had their homes destroyed or damaged beyond repair. The reports stated that during the three day ceasefire, many Palestinians allowed to return to their homes. However, many IDPs found their homes uninhabitable. After the Israeli military resumed its military offensive in Gaza by Friday morning, many of them reportedly rushed back to the United Nations-run shelters where many have been sought protection and security. As the Gaza war continues unabated, the number of IDPs in U.N. shelters would be likely to increase due to the heavy destruction of Palestinians' houses during Israeli heavy bombardment. Since the start of Israel's occupation in 1967, the figures show that the number of IDPs in Gaza Strip and the rest of Palestine reaches to 475,000. This means that nearly 25 percent of Gaza's 1.8 million populations has forcibly displaced within the small territory of the occupied Palestine. Apart from the ongoing Israeli military operation, Palestinians have long been suffering from Israeli military operations since 1967. According to IDMC, The Israeli military operation "Cast Lead" in December 2008, led to 17,000 Palestinians remained displaced in the Gaza Strip as their homes were completely or partially destroyed. Also, prior to the 2008 Gaza war, at least 129,000 Palestinians were reportedly displaced between 1967 and 2009 as a result of the demolition of their homes and livelihood.